If I had to ask you what your New Years Resolution was, would it have to do with saving money? I'm sure most of you are saying yes. I know for me. This was my main goal. From eating out less, to shopping sales and of course, watching how we use electric. Now that we are a family on a budget, I personally like to find more ways to save money and to save energy around my home. Like, making sure all the lights and TV's are off. But with kids, things don't always work out as planned. Which is why, there is no better time like the present to start teaching my daughters how to save and the value of a dollar. I am constantly encouraging my daughters to turn off lights when they are not in a room, or to use their lamp in their room with power saving bulbs instead, which we changed together. Our big thing is making sure their TV is off before they fall asleep and trying to use a night light instead. Another problem is making sure everything is off in their room before they go to school. Sometimes I find myself coming home to lights and TVs on. But now, I lead by example. I show them by making sure everything in our room is off and guess what they are picking up on it. Just the other day I walked into their room and nothing was on! So proud! Even though gadgets aren't big in our house. We have a little electronic dog, that constantly needs to be charged. My daughter likes to leave the charger plugged in the wall, even when the dog is fully charged. So now, instead of getting upset and unplugging it myself, I simply remind her to unplug the charger when not being used. It's little things like that, that help us save BIG. Now, let's talk about Direct Energy CT, Direct Energy CT wants to help people like you and I save even more money and have a selection of budget-friendly fixed rate plans for customers that want to find more ways to save on the ever increasing cost of electricity around their home. Along with helping on the way we save energy and allowing switching of companies to be as pain-free as possible and they even offer a rewards system with Plenti. So we can teach our children how to save even more with points back for rewards on the things we enjoy, at home, like Hulu. Direct Energy has special offers in CT the month of January! Connecticut - Save up to 25%* over United Illuminating’s electricity rate, and up to 18%* over Eversource’s electricity rate. *All savings refers to the current difference between Direct Energy's fixed rate offer and the Utility’s current Fixed Rate for Basic Service as of January 8, 2016, and does not include any other component of the electricity bill. Utility rates are subject to change and there may be no savings following the respective official utility rate change date. Direct Energy's fixed rates include electricity supply charges only and excludes delivery/transmission charges, taxes, and all other utility-related charges. Offer is limited and valid for new residential customers only. How do you plan to save Energy in your home this year? Our house is HUGE on electronics. We all have phones, tablets, and computers. Something is always charging and the heat is always on. Our electric company loves us--I know. We're always looking for ways to save money on our energy bills. Luckily Texas has Power to Choose with all the providers and their current rates/promos listed side by side, plus you can easily change from year to year as the deals come up. We pretty much change providers every year so we can get the best deal! It's always great to save on electric! The last thing you want ever month is a high bill! I've heard really good things about Direct Energy! I am always reminding everyone in our house to shut off lights and TVs. It can be so wasteful and expensive. I will have to check out Direct Energy CT. I love finding new ways to save on our electric bills! This sounds like a great program. I'm always mindful to shut off lights when leaving a room! Finding ways to save is such a great thing! I have never really thought about looking into this strategy to cut expenses, but I am going to check things out. It would be so nice to cut down our energy bills significantly this year. It's pretty cool that Direct Energy is part of the Plenti rewards program. My fiancee is crazy about going around and making sure we've shut off all the lights and fans. It does always seem like we are constantly charging a device or toy though, we could probably scrutinize that a bit more to save on energy! This is awesome. Anything related to SAVING and CONSERVING is a good read for me. Love it! I'm always interested in learning more ways to save. This is great for us Floridians. Electricity costs so much here. It is a hard thing for us to remember too as me and the girls are here all day long. I turn on their light for them to play in the morning and I definitely don't remember I did that until sometimes 1 to 2 PM when I put them down for a nap. This sounds like a great benefit to people like me! this is such a great reminder. so often we go from room to room just leaving lights on. i need to do better! 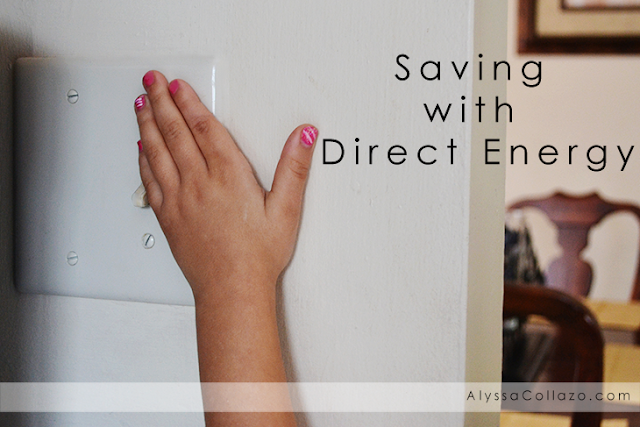 This is an awesome post on ways to save direct energy. I think everyone should try to save energy for the enviroment and money. I unplug all of my electrical items I am not using at that time. I also use energy saver light bulbs. I make a note of saving energy as much as possible...we always unplug phones, chargers, etc. that aren't in use. I try to shop around for electricity when our contract is up. I also found that having a wifi enabled thermostat is amazing at saving money. We have saved hundreds in the past few months. I live in Atlanta so I dont have this! My mom always told me to cut off all the lights in the rooms you arent using and I still do that today!